You would think the answer would be fairly straightforward. But it took a lot of digging to come up with the answers surrounding account and profile deactivation — and full-blown account removal from the service. After doing the research and walking through the deceptive complex process, it is apparent that Facebook has done its very best to prevent its customers from leaving its service, which would of course limit the amount of customer data being scrubbed from its service. Personally, I feel Facebook has crossed the line of unethical behavior on this. After all, Facebook doesn’t actually provide an interface to easily delete your account and end your agreement with them regarding the use of your personal per section 2.1 in its terms of service. You own all of the content and information you post on Facebook, and you can control how it is shared through your privacy and application settings. In addition: For content that is covered by intellectual property rights, like photos and videos (IP content), you specifically give us the following permission, subject to your privacy and application settings: you grant us a non-exclusive, transferable, sub-licensable, royalty-free, worldwide license to use any IP content that you post on or in connection with Facebook (IP License). This IP License ends when you delete your IP content or your account unless your content has been shared with others, and they have not deleted it. There is plenty there to chew on, especially the areas I’ve highlighted in bold. I’ll speak a bit about this later, let’s continue on with account deletion and deactivation. 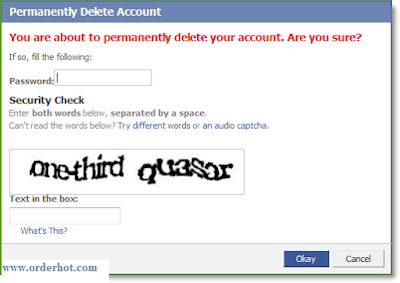 Deactivating Your Facebook Account: The same as Deleting your Account? Users can deactivate their Facebook account from the user interface without too much trouble. Facebook will ask you to confirm your decision by displaying one of your friends and telling you “Your Friend will miss you”. Once you confirm you want to deactivate your account, be sure to read the fine print. It clearly outlines that account deactivation is not the same as deleting your account / profile. By deactivating your Facebook account, you’re merely disabling your ID however all your data remains on Facebook servers. What surprised me was the fact that even after the account is deactivated, you can still be tagged in photos, invited to events, etc.. With this in mind, be sure to opt out of emails if that’s the path you’re going down. …is still in effect. And, being that pretty much anything you plug into Facebook is immediately shared with your friends, per the Facebook Terms of service (see highlight in bold), the license you grant Facebook stays in effect indefinitely even if you do manage to delete your account permanently. Oh, and it gets better. To re-activate your account, all you need to do is sign-in to Facebook or use your Facebook ID to sign-in to another service (or post a comment on some sites) and everything is right back where you left it as if you never left – pictures, friends, posts, your IP…. So I think everyone will agree with me in that the Facebook Account / Profile deactivation process is worthless if your goal is to delete your account and remove some of your data or IP from the service. Seriously.. The “real” good news is there actually IS a way to delete your account. Deep in the bowels of the Facebook help center, you can find the URL to permanently delete your Facebook account. Deleting your Facebook will delete all of your account information and remove your ability to login to the service. Photos, friends, messages, status updates etc… According to Facebook, there is no way to restore your account and your data once it has been permanently deleted. With that in mind, please move forward reading all large and fine print. So let’s get started on permanently deleting your profile. You’ll be asked to confirm. Type in your password and solve the CAPTCHA. Click Okay to continue. Even after confirming the deletion of your account, Facebook will only deactivate it, leaving you 14 days to log back in and cancel the entire deletion. 1. I completed the scavenger hunt and found the DELETE link. 2. I saw the BIG RED TEXT warning me my account would be permanently deleted. 3. I entered my password. 4. I helped translate a book for GOOGLE by solving the Captcha puzzle. What part of delete my account don’t you understand Facebook? Perhaps you thought I was joking? Or drunk? But if that’s the case, why the five steps above? Yes Regis, that’s my final answer! Delete my account! Anyway, I think it’s pretty obvious by now Facebook doesn’t consider you a customer from a customer service point-of-view. Facebook is in the data business — more specifically, your data and it will go to great lengths to keep that data including your employment, school history, friends, network, photos, tagged face etc… which it managed to collect from you over the years in its social web. The 14 day grace period is Facebook’s last-ditch attempt to somehow lure you back into the service either accidentally or from some subconscious Facebook addiction in order to abort the account cancellation process. With this in mind, here’s a few tips to make sure you don’t “accidentally” log in to Facebook thus aborting your account nuke process. Now, I can’t make any promises that after all this work (and 14 days of course) Facebook will delete your account because it’s not my company. This is however the process which it laid out on its website (if you managed to track it down). Good luck, unfortunately you’ll need it.